Clean Vents Cleaning Fort Lauderdale. Breathing clean, pure air inside your home is just as important as clean carpets, floors and furniture. In fact, the air you breathe may be the most important part of maintaining a healthy indoor environment. Thats why companies like Air Purification Tech air duct cleaning Fort Lauderdale, a team of experienced and trusted HVAC experts, exist  to make the air you breathe that much better for you and anyone else who spends time in your home. Thanks to a powerful vacuum and filtration system, our Fort Lauderdale technicians will extract microscopic harmful contaminants and allergens that are floating around. With just one deep cleaning service, your homes Indoor Air Quality (IAQ) will be measured and purified, which has an immediately positive effect on your health its as simple as that! Clean Vents Air Purification Techs dryer vent cleaning team is trained to find microscopic debris using powerful equipment. Our HVAC expertise can actually help your wallet, as having a more efficient air duct system improves efficiency and reduces monthly bills. If you hire Air Purification Tech to deep clean your air ducts once every 24 months, youll breathe cleaner, fresher air; were also happy to replace any air filters, if needed. As members of the NADCA  the National Air Duct Cleaning Association  our team keeps our finger on the pulse when it comes to performing the most efficient cleaning procedures. We learn how to perform these cleaning procedures safely and effectively by taking direction and coaching from the National Air Duct Cleaning Association (NADCA). As active members, Air Purification Tech Fort Lauderdale is held to the highest standard when it comes to working with customers like you. Not only are we held to the NADCAs standards when we clean your homes air duct system; we also hold ourselves to the highest standard through our 100% satisfaction guarantee. If we need to reclean your air ducts, we will do so for free  our main goal is that youre 100% satisfied. If the recleaning isnt effective, well go ahead and refund your money. If we accidentally cause damage to an item while we clean your air ducts, well take care of all the repairs necessary to fix it. And if the repairs arent possible, well give you a cash credit thats equal to the items value so you can buy a replacement. Give your homes Indoor Air Quality a healthy boost to improve your own health! 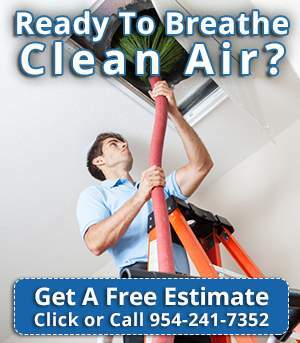 Call Air Purification Tech Fort Lauderdale today to set up a free air duct inspection.